Pink and spring green! 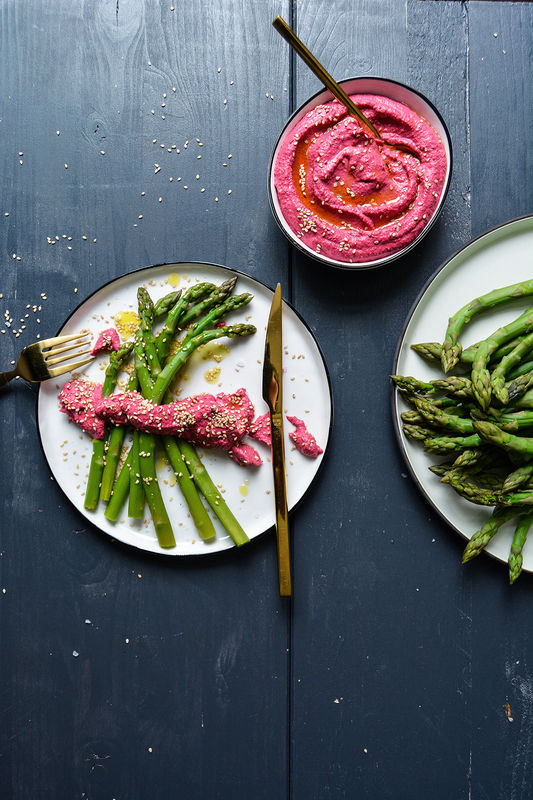 Today’s dish celebrates this vibrant colour combination and I can’t really say that I expected the result to taste that good. 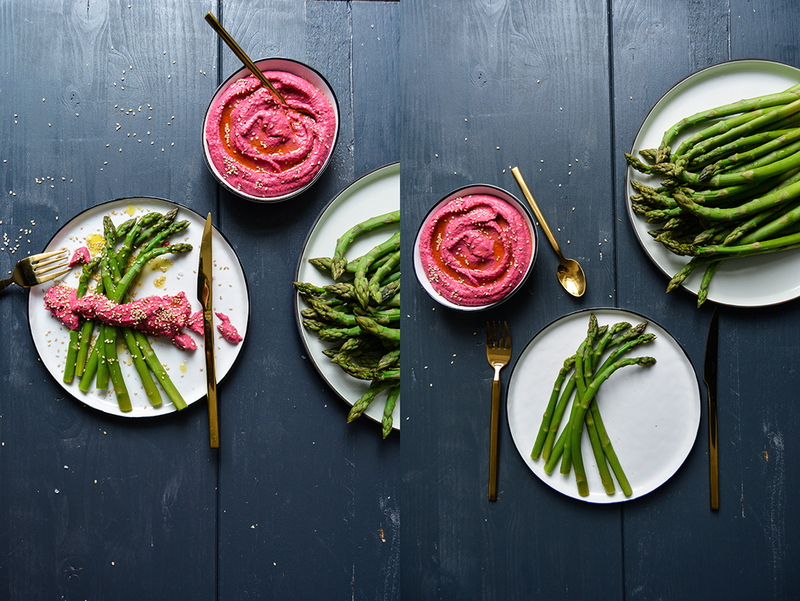 My green asparagus stalks found a perfect companion in a screaming pink hummus. I adjusted its colour and taste by adding a generous amount of boiled beetroots. At first I was worried that the roots’ earthy tones would dominate, so I started with one root for a small can of chickpeas. But there was no need to worry. 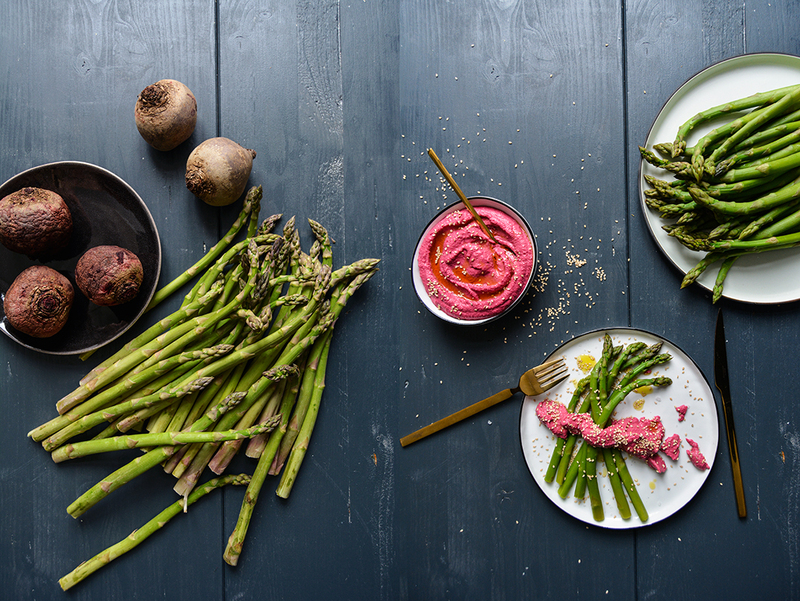 The beetroot easily found its place in the nutty dip, in fact, it’s a fine sweetness that comes through the most. Before the roots kicked in, I used my basic hummus recipe to start with. It perfectly balances out the flavours of chickpeas, rich tahini, sour lemon, and the punch of fresh garlic and ground cumin. 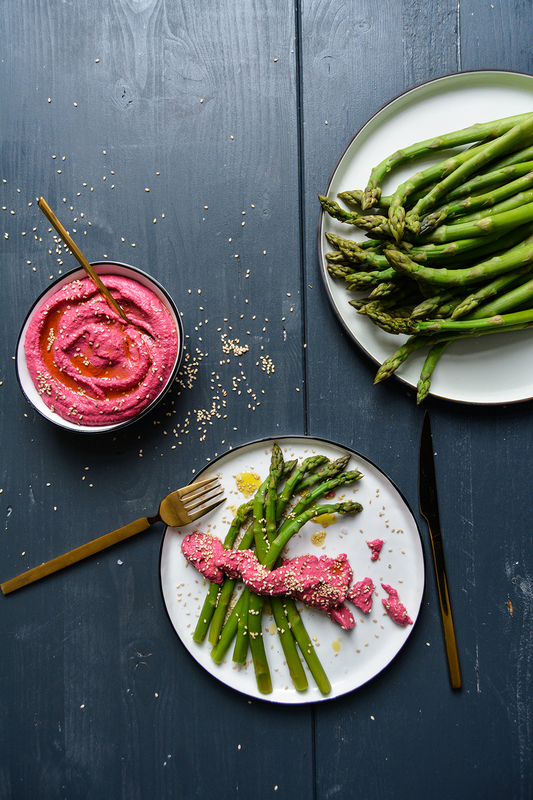 It was a recently published cookbook that inspired my to turn my hummus pink. Joel MacCharles and Dana Harrison’s book called Batch, a comprehensive collection of pantry recipes, caught my attention and made me wish I had a whole room and not just a shelf to store my jars of preserved goods. Their book covers various methods for canning, dehydrating, fermenting, cellaring, salting, smoking, and infusing. As I thumbed through the pages, I noticed that there are still a lot of preserving techniques I have to learn more about. I cook my own jams and chutneys, preserve my gherkins, lemons and other fruits and vegetables, I learned to make gravad lax from my mother (a recipe that comes to use at least once a year), but I’ve never made my own sauerkraut or smoked mussels. Batch is a book that needs time and attention, a book that gives you lots of basic recipes to follow and not to experiment with. It’s about learning the right techniques to be able to fill the shelves in your pantry with pride and satisfaction. However, the duo also included quite a few creations that allow you to play with your preserving results and be creative. 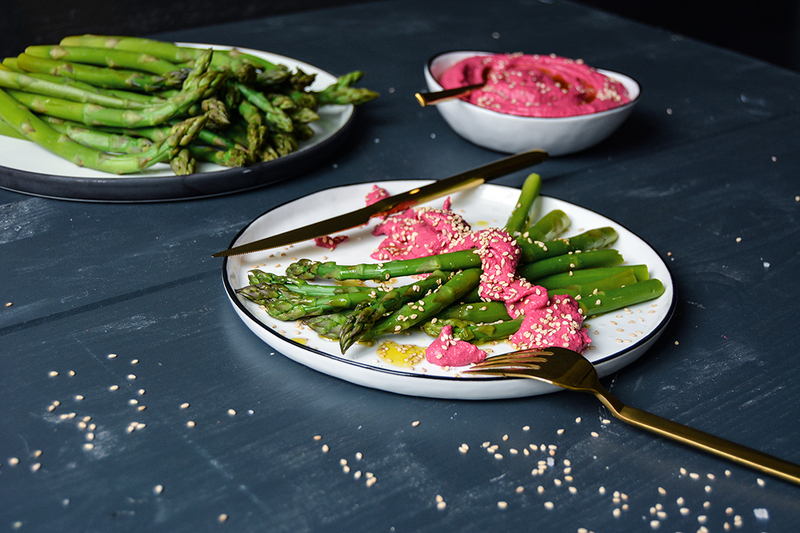 In the beet chapter, Joel and Dana write about a pink beet hummus, which is different to mine: they don’t add chickpeas, it’s the pure red root that shines. 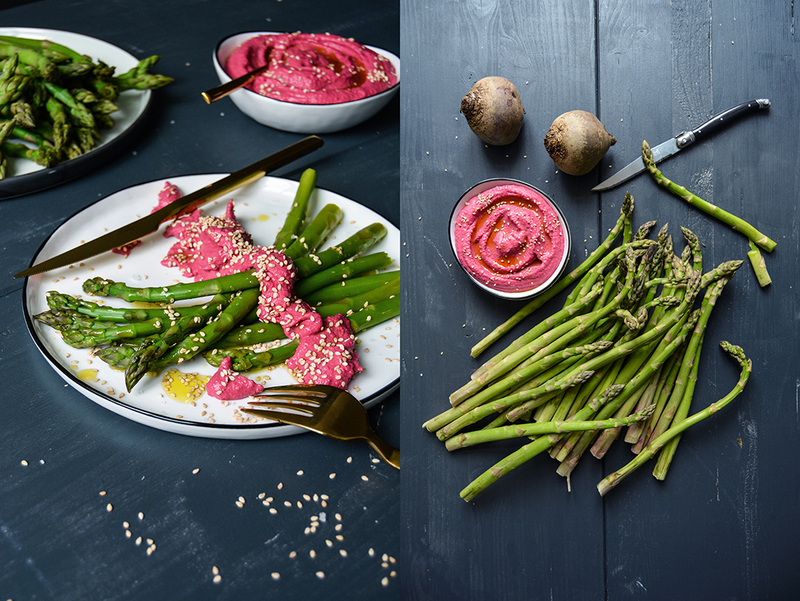 Below you can find both recipes, my chickpea and beet hummus and Joel and Dana’s pure beet hummus. Try both and enjoy. I just love my chickpeas. But don’t forget to add green asparagus cooked al dente, it’s too good. And use the leftover dip to spread on dark spelt bread. Bring a medium pot of salted water to the boil. Add the beetroots (with their skin) and bay leaves, cover with a lid, and cook the roots over medium heat (simmering) for about 45-55 minutes or until tender. Rinse with cold water and let cool for a few minutes. Peel the roots and weigh 200g / 7 ounces, use any remaining beetroot for another recipe. Using a food processor or blender, purée the beetroots and 2 teaspoons of olive oil until smooth. Transfer to a bowl and set aside. For the hummus, using the same food processor or blender, purée the chickpeas, tahini, water, lemon juice, garlic, cumin, and salt until smooth. Add half the puréed beetroot to the hummus and purée until well combined. Add more puréed beet until the hummus has the desired taste. I added the whole 200g / 7 ounces of beet. Add more lemon juice, salt, and cumin to taste. Cook the asparagus in plenty of salted water for about 3 minutes or until al dente, rinse briefly with cold water, drain, and transfer to a large plate or divide between the plates. 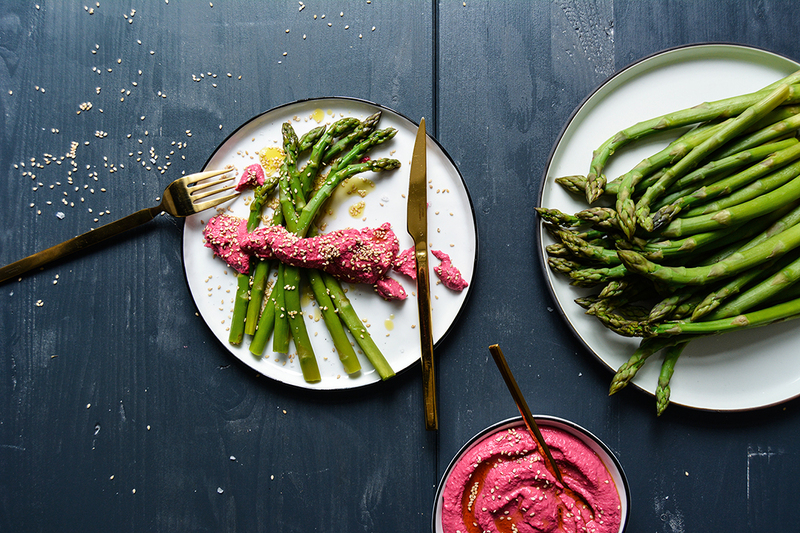 Serve warm or cold, drizzle the asparagus with a little olive oil, and sprinkle with sesame and salt. 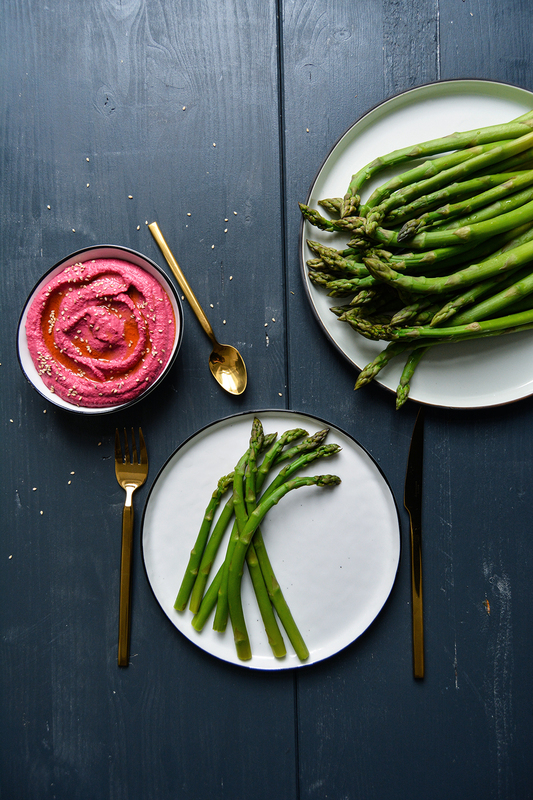 Dollop a few teaspoons of the hummus over the green stalks and enjoy! Place the garlic in a blender and chop until fine. Add the tahini, cumin, sesame oil, and lemon juice to the blender. Scrape the sides to make sure the garlic is incorporated and blend for 10 seconds. Add the beets and blend until smooth. 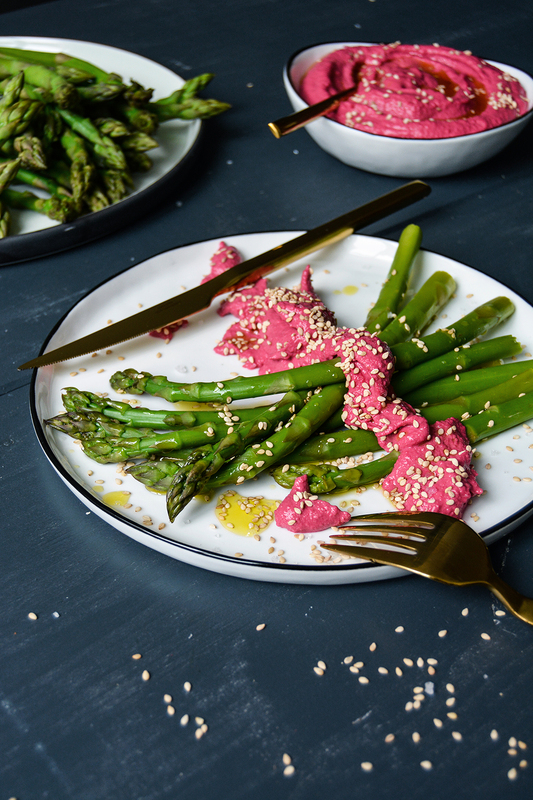 Add the beet stock, 1 tablespoon at a time, until the hummus achieves the texture you like (you may not use the whole 60ml / 1/4 cup or you may have to add more). Chill in the fridge for a few minutes before eating (optional). Serve in a bowl and a drizzle of olive oil.